Looking to purchase wines from around the world with free shipping and no minimums, sent to you as a mixed case? We’ve got you covered in our Mini Anything Goes Marathon. 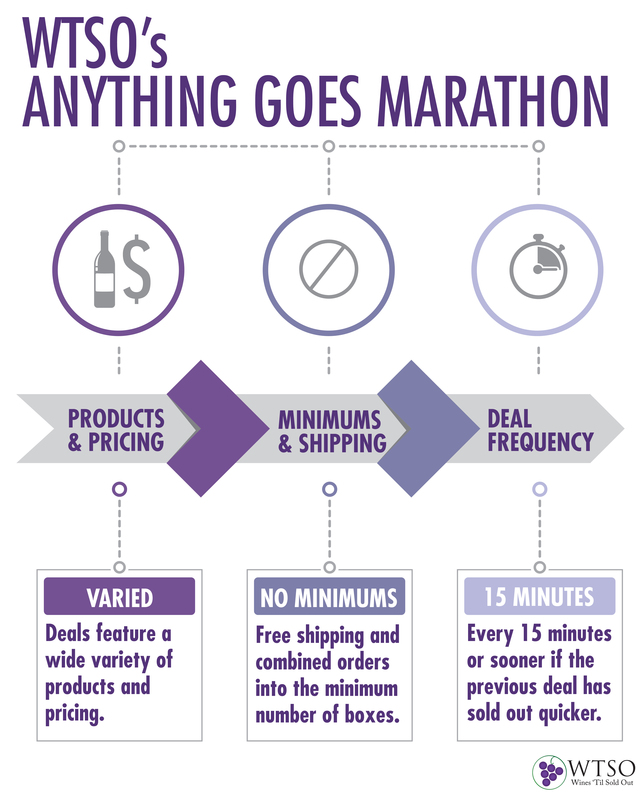 Our Anything Goes Marathon was created so you can order just one bottle with free shipping. This way you can stock your cellar with varietals you may have not tried otherwise. Take a Barolo wine for example. Never tried one? Here’s your chance to pick up a bottle and give it a shot. Then we took it a step further – we’re always looking for ways to make our shipping process the best out there, so for a Marathon that will allow you to buy as little as one bottle, but as many deals as you would like, we decided we would take a little extra time to combine any orders placed within the Marathon into the minimum number of boxes. So whether it’s the ability to expand your wine palate or stock up on wine deals to be delivered as a combined shipment, this Marathon is one not to be missed. Shipping Minimums: Free shipping* and no minimums. If multiple deals are purchased during the Marathon they will be combined into the minimum number of boxes after the event is over. Ship Date: All orders will ship on 2/11 unless a future ship date is selected at checkout. Holds: If you won’t be available to sign for your package, or are concerned about your wine shipping in certain weather, we’re happy to store your orders in our temperature-controlled warehouse up to 12 months at no cost. Simply select a future ship date during checkout. Don’t miss out – Create An Account now to start receiving our daily wine deals. We’ll send you a reminder about the Marathon once it gets closer. *Free Shipping, excluding Hawaii and Alaska.